VietNamNet Bridge – Nguyen Thi Dieu Linh, 32, entered a field dominated by men when she took the helm of a technical bomb-clearing squad in Quang Tri Province. Hoang Hoa Sen reports. Quang Tri in central Viet Nam is the area that has the largest number of unexploded bombs and shells in the country. Now, for the first time, a young Vietnamese woman is the manager of the technical team that cleans cluster bombs and other explosives in the province. 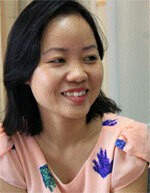 Nguyen Thi Dieu Linh was promoted to the position of the Norwegian People's Aid's (NPA) operations manager at Project RENEW in Quang Tri eight months ago. The 32-year-old woman manages 160 technicians and support staff, who comprise 26 teams that are deployed every day. Team members map confirmed hazardous areas for clearance and provide the explosive ordnance disposal (EOD) team of the NPA response to safely dispose of cluster munitions and other unexploded ordnance throughout the province. Linh said this job was a huge opportunity and also a great challenge for her. She took the job when the project grew by three times after receiving huge new funding from the United States Department of State to expand its operations to the whole of Quang Tri Province. "About 23 per cent of the total operational staff is female. Earlier, we had only men working as searchers, but during the last two to three years, we have started recruiting women to work in the field," she said. It might be difficult to believe that this young woman is in charge of work that is normally handled by men. She said she was happy to receive the support of colleagues and very experienced experts. The job came to her by chance. She said she did not have any knowledge about bombs and mines just 10 years ago. It all began in 2009, when she was recruited as an interpreter for Project RENEW of the NPA. "At the beginning, I didn't even know such simple specific words as shell or mortar shells. I had to look up those words in the dictionary. I was not afraid of working with bombs and mines, like some other beginners," she said. As an interpreter for foreign experts, she had the opportunity to learn a lot from them about dealing with bombs and mines in the post-war period. As she became more and more interested in this work, she underwent several training courses. Her training was of a high international standard, and she was awarded the "International Mine Action Standards (IMAS) Explosive Ordnance Disposal (EOD) Level 2" certificate granted by the NPA. In February 2015, she was appointed as manager of the technical team for cleaning up cluster bombs and other explosives in Quang Tri. In charge: The 32-year-old woman manages 160 technicians and support staff, who comprise 26 teams that are deployed every day. 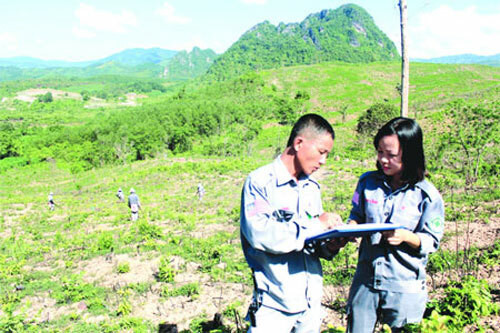 However, Linh doesn't consider herself to be an expert of unexploded ordnance in the province. She said she has benefited from years of working with highly skilled technical experts such as Colonel Hong, senior advisor to Project RENEW and a Vietnamese war veteran, as well as representatives of international organisations such as the NPA. "I've learned a lot from Col Bui Trong Hong, experienced team leaders and international colleagues. They have played a very important role in building capacity for local staff. Thanks to this capacity building from international colleagues, especially the NPA in recent years, the Vietnamese staff at Project RENEW are now able to conduct, supervise and coordinate all field activities by ourselves. This is a huge jump forward," she said. In her job as manager of a very large technical demining operation, Linh helps local residents to save lives, reduce accidents and injuries, and remove unexploded bombs and mines. Even though it is a very dangerous work, since 2007 when Project RENEW was initiated, NPA teams have never had an accident or injury. "Safety is always our number one priority. We always work in accordance with the highest international standards and the best available procedures, and everyone is trained in accordance with the International Mine Action Standards. In addition, we strongly maintain discipline among our team, and work safely," Linh said. Quang Tri has established its Legacy of War Coordination Centre and Database Unit, which support and work very closely with all mine action operators in the province. Linh said after about five or seven years, Quang Tri people would have a much safer life. "There will still be some random items that roving teams and the military must take care of, but highly contaminated areas will be cleared, people can use the land safely and will know what to do when they encounter random ordnance." At home, Linh is a wife and a mother. For a woman to take an important job in the workplace, with more responsibility than a man, and to be a good mother and a good wife while doing the job well, is considered to be quite a challenge. "I have one daughter. I'm very lucky that my husband is very supportive, so we share the task of taking care of our daughter. Of course, I always try to balance everything so I have time for my daughter and my family. "My work related to cleaning up cluster bombs and other explosives may be challenging, but I am proud of it and proud of being part of the community's efforts to relieve the pain of war," she said.